“A 16-year-old girl with the voice of Isolde.” That’s how composer Richard Strauss described the requirements for the title part of Salome, his magnificent one-act opera that shocked audiences at its premiere in Dresden in 1905. He was referring to the biblical daughter of Herodias, who danced for the lecherous Herod and in return demanded the head of John the Baptist – Jokanaan in the opera – on a silver plate. Oscar Wilde expanded on the story’s eroticism and degeneracy in his play (written in French), and Strauss wrote his own libretto, trimmed down from a German translation. In either form, Salome is the ultimate dangerous and beautiful seductress. What a glorious score this is! Salome’s “Dance of the Seven Veils,” a nine-minute operatic striptease, may be the most famous excerpt, but Strauss’s music was in the style of his mentor Wagner: heavily orchestrated, overpowering, demanding voices of immense strength – and often, corporeal brawn to match. Conductor Timothy Myers brought out the richness of Strauss’s orchestration, highlighting individual solo moments while still accommodating the needs of the singers on stage. There isn’t any 16-year-old who could sing Isolde. 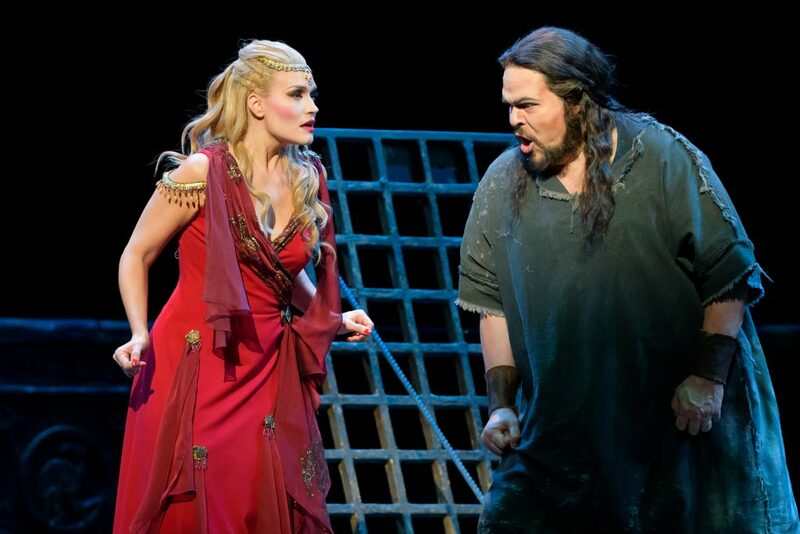 Stereotypically at least, Wagnerian sopranos don’t resemble teen-aged nymphets. In the early days, a dancer would substitute for the soprano at the appropriate moment. Arguably, the greatest Salome of all was Bulgarian Ljuba Welitsch, – not sylph-like but vocally and temperamentally ideal for the part – who made the part her own in the 1940s and 1950s. 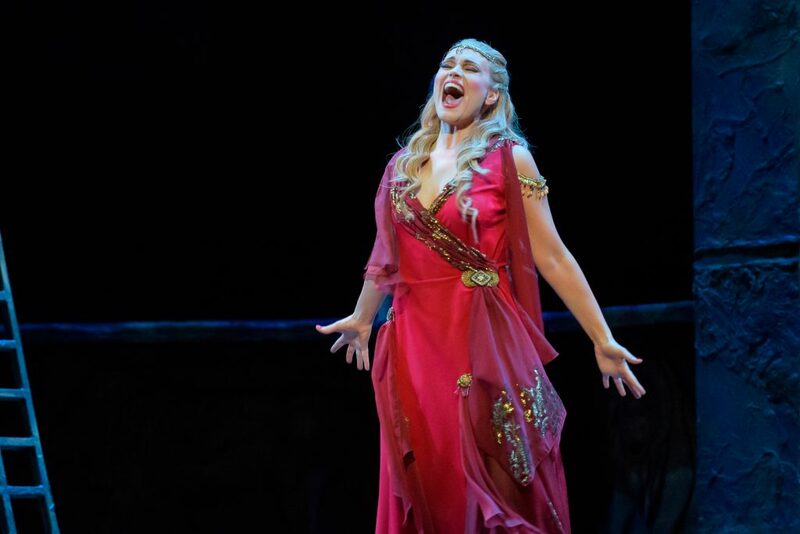 Pennsylvania soprano Kirsten Chambers, Florida Grand Opera’s second-cast Salome (seen at Broward Center on Feb. 10), is no teenager; but she’s tall, svelte, and drop-dead movie star gorgeous. More to the point, she has training as a dancer, extraordinary musicianship and a voluminous penetrating voice that can ride the mammoth orchestral sound and sound as fresh at the end as in her first lines. It’s no surprise that she was hired as a cover (understudy) for Isolde at the Met in 2016, as well as for Salome. And when the scheduled singer became ill, Chambers made her unexpected debut on less than a half-day’s notice. Salome is a killer role, but this splendid artist was vocally and physically fearless. She dominated the proceedings, and performed the dance with agility and allure – along with the now-obligatory flash of full frontal at the end. In her central confrontation with the tangibly imposing, sonically stentorian Jokanaan of Mark Delavan, Chambers was up close and personal, hardly wincing at the prophet’s vicious rejections. Her voice rang out in the upper range, projected reasonably well in the middle, then took on an appropriately sinister timbre in the very low excursions that pepper her maniacal final scene solo with the severed head. In Salome’s final excruciatingly high vocal line, a point where many singers weaken and rush through, this imperturbable soprano looked straight at the conductor as together they drew out the top notes with seemingly endless stamina and exultation. Bernard Uzan persuasively directed the attractive physical production, borrowed from Pittsburgh Opera, the sets by Boyd by Ostroff, costumes by Richard St. Clair. With few props, not even a table and chairs for Herod and Herodias to feast at, individual figures came to the fore. 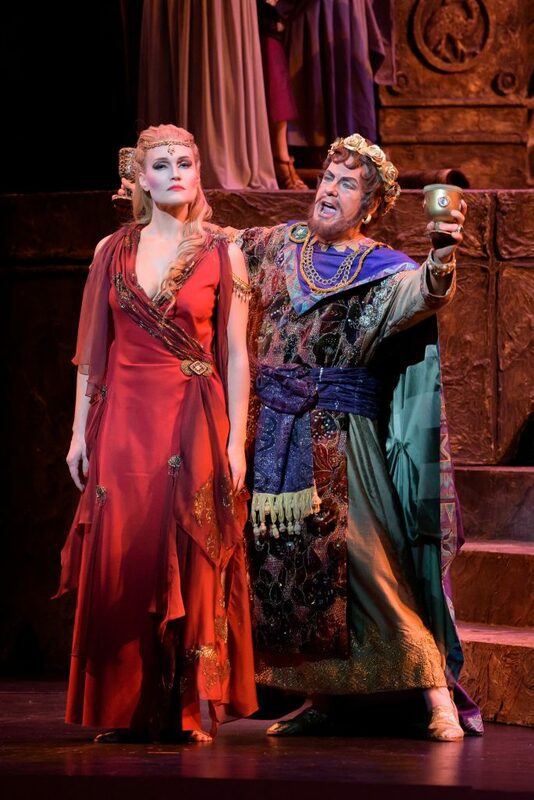 Aside from Salome, the most forceful portrayal was the Herod of John Easterlin. With a pungent tenor sound and willingness to sacrifice traditional vocal beauty for dramatic effect, this superb singing actor chewed the scenery and turned his every word and gesture into the essence of depravity. He was well partnered with the rich-toned, colorfully inflected Herodias of Elizabeth Bishop, in her own way a theatrical force to be reckoned with. Tenor Benjamin Werley, a member of FGO’s studio program, accomplished the considerable double feat of performing with lovely lyricism the soldier Narraboth, who kills himself for his unreturned love of Salome half way through – the singer returning shortly thereafter as a member of the intricate, fiendishly difficult quintet of Jews arguing over theology. Among smaller roles, Rafael Porto distinguished himself in the melodious lines of the Nazarene proclaiming the miracles worked by Jesus; and mezzo-soprano Mariya Kaganskaya enacted competently the Page in love with Narraboth.